Step right up, get your leaked Avengers: Endgame images while they’re still hot (and Disney doesn’t destroy all trace of them). That’s right: a naughty little so-and-so has shared a few pieces of images he shouldn’t have on his Twitter feed. Not those kind of images, mind. Something even filthier: a new look for Hawkeye, a big change for Iron Man, and a bloody Infinity Gauntlet replacement for Thanos. It’s all there – and more – down below. But, first, a disclaimer: these Avengers 4 photos (h/t MovieWeb) could be fakes. If they are fakes they’re very, very good ones and Marvel Studios should be hiring the artist immediately. But they’re also in line with previous pieces of concept art that have been found in the wild across recent months. For now, they’re as real as real gets. At least, I hope so – because they’re so, so good. No, you don’t need an eye test. 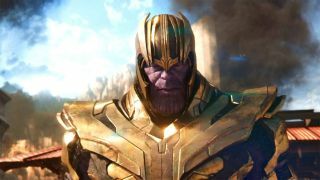 This piece of Avengers 4 concept art is a little smudgy, but it gets the point across. It answers the question of where Hawkeye has been in Avengers: Infinity War, too. He’s been out getting an incredible new look, complete with Assassin’s Creed-style gear. Iron Man’s new suit, a Mark 85 according to the leaker on Twitter, is looking pretty swanky. But it’s Tony Stark’s brand-new reactor that’ll turn heads. It’s green, for one thing, but. knowing Stark, I’ll bet it does something fancy. Is this the key to time travel, perhaps? It sure looks like a Time Stone knockoff. We know Thanos isn’t to be trifled with – but this is ridiculous. With the Infinity Gauntlet burned out and (presumably) rendered useless, the Mad Titan has gotten a pair of replacements: two massive swords. Now all I want in life is a Thanos vs. Cap showdown where he slices Steve Rogers’ shield in two. Not only that, but we’ve been given a look at Captain Marvel, who looks suitably unimpressed with the situation she’s found herself in. Maybe the proximity of the two images on the leaked sheet could hint at a scrap between Ms. Danvers and Thanos? After the shield-splitting, of course. What do you make of the leaked Avengers 4 images? Has it done the impossible and made you even more excited for May 3, 2019’s release? Let us know down below! Want to hear about the Avengers: Endgame ending straight from the cast themselves? Of course you do!